Metallic studs can be found on an array of furniture today, including sofas and chairs. It’s a style trend that has gone in and out of vogue over the years, but is definitely in fashion at the moment. Primarily used around the edges of a seat, they originally had a more functional nature, but now they tend to be used as a decoration in luxurious furniture, evoking a sense of opulence and allure. Studs started to appear in chair designs during the 17th century. Before then, the frame of a chair was rarely upholstered, instead a loose cushion would be added to a wooden chair for comfort. When the idea of permanent upholstery arrived, studs were used to attach the leather or fabric to the wooden frame. 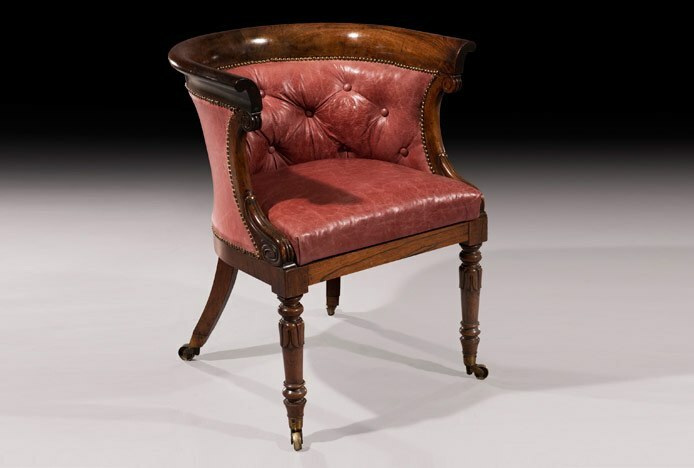 Chair makers often chose to leave them uncovered, and so they became a functional feature that also had a decorative appeal. Traditionally, brass, copper, and pewter were the materials used and the head usually had a round domed shape. 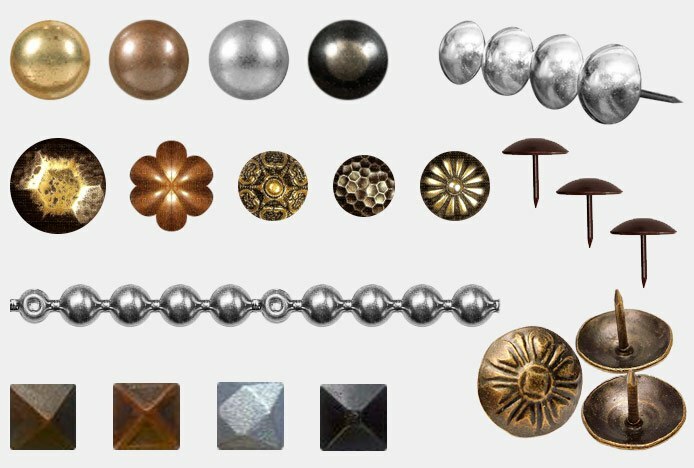 Today, studs go by various names, such as tacks, nail heads, and rivets, and there are numerous types with different designs, shapes, and finishes, each suited to different décor and furniture styles. There are high and low domed round designs, square nails with pyramid designs, unique shapes like diamonds and flowers are also used, and some even have decorative patterns engraved in the head. Brass and copper varieties are still popular on vintage-style furniture, as they tend to have a more antiqued finish. Silver, brushed steel, and chrome, are the more popular choice today, and there are also enamelled, and powder coated styles, and even diamante versions are available. These modern types are chosen for their decorative purpose, used to bring a bling-factor to lavish pieces of furniture and create the popular glamorous look. There are two ways of fixing the studs in place. They can be nailed in individually, which is good for awkward places like corners and bends, or a strip of studs may be used to give a neat straight line. We use the individual method, ensuring each one is evenly spaced and not too close together as is often found in strips, it also gets a better flow around corners and tight spaces, giving a careful handcrafted touch. 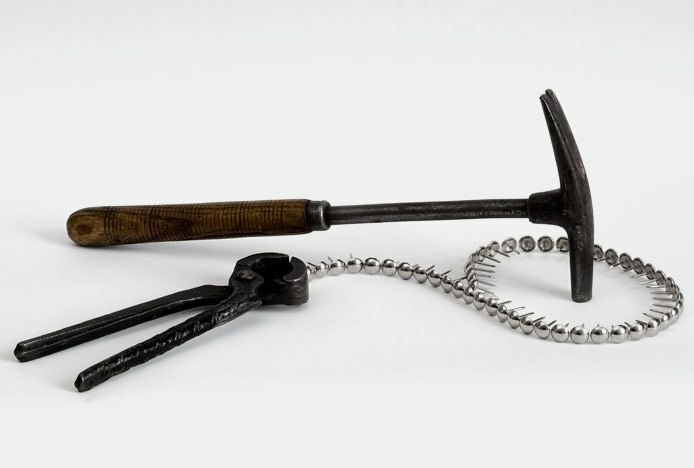 During the process, the upholsterer uses a nylon tipped hammer to avoid damage and scratches to the head of the stud. A template or a tool called a quick-nailer is often used to ensure they are of equal height and spacing, but a highly skilled upholsterer may choose to position them by eye. Each one is hammered in through the upholstery and into the wooden frame, and it’s for this reason that studs cannot be applied to metal framed furniture. In many of our fabric bar stools and chairs, we use studs to edge the seat, which is where they would traditionally be seen, but you may also see them on the backrest, for extra elegance, as seen in our Arlington Dining Chair. For a real extravagant look, some designers choose to stray from the edge of the seat and even use them to create swirls and patterns in the upholstery. They are a popular addition to chairs and sofas with the classic Chesterfield look, so we often pair stud edging with other traditional features such as button detailing and a scroll back. 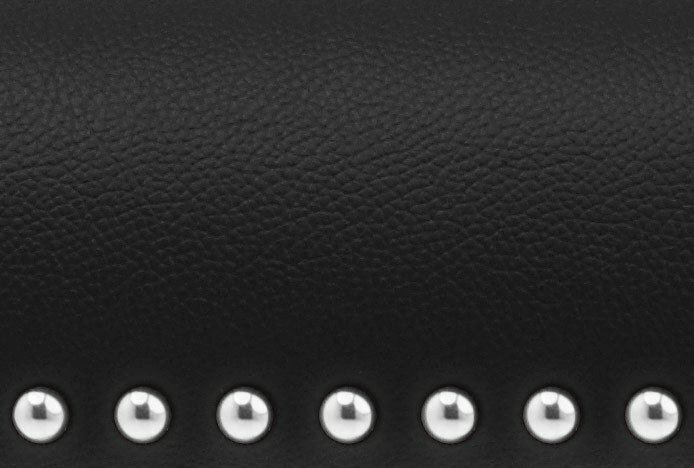 For now, studs are here to stay, so be sure to check out our range and bring an exclusive feel to your interior. Love the industrial look? You'll love our brand new collection of vintage style stools..
From classic to contemporary, check out our range of matching stools and chairs..
Are Ornate Chair Legs Making A Comeback? Check out the chair legs of the past and see how they’re making a modern comeback..